You are here: Home / Blog / Is Curry Powder Spicy? The word curry comes from the Tamil word kari, which means spiced sauce. It refers to dishes with a spicy gravy, which are common in Southern Indian cuisine. 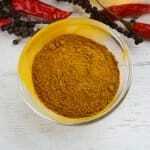 Curry powders are helpful for Non-Indian cooks who may not have a lot of experience working with Indian spices. They provide the spices in the correct amounts so that the inexperienced user does not have to worry about measuring them individually. One of the common ingredients in many curry powder blends is chili pepper. So is curry powder spicy since chilies are often predominant? 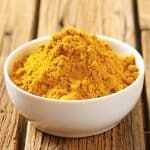 Curry powder can be spicy, but not always. Regional preferences tend to have a lot to do with the level of heat in the blend. Let’s break down some of the most common types and their overall spiciness. It should be noted that while masalas are not called curry powders, they are technically the same thing. Masala simply means spice blend, which is a category that includes curry powders. Garam masala is an authentic Indian spice blend and is said to be one of the influences behind classic British curry powder blends. 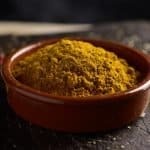 While individual blends can vary in heat level, you will find that most of the hottest curry powders come from the same general geographic locations. The hottest tend to include ingredients most commonly used in from Southern Asia and Southern India in particular. Vindaloo curry powder replicates the flavors of one of the hottest South Indian dishes. It is often described as the hottest of all the curry powders. Like Madras curry powder, it has a European creation in that it is a blend of Indian spices made to please European taste buds. Vindaloo comes from the Portuguese dish Vinh d’Alhos. Vindaloo is the Indian version of that dish. It was introduced to the Goa region of India that was once a colony of Portugal. Madras curry powder is another spicy option that contains spices used in Southern India, but there is no such thing as Madras curry powder in Indian cuisine. This curry powder is said to have originated in the Indian city once known as Madras, but which is now known as Chennai. Malaysian curry powder is another European-influenced blend of Indian spices. As with the other blends, its heat level can vary as Malaysian blends may be mild or moderately hot but are usually not excessively hot. Traditional Thai curry dishes are made with curry pastes rather than powders, but powders are also available. 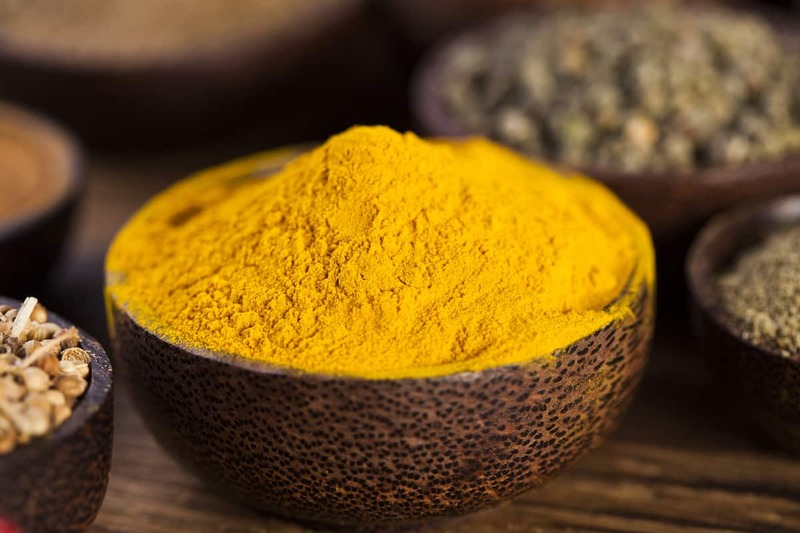 Yellow Thai curry powders will include the turmeric and other spices that you find in Anglo-Indian blends but can include Thai herbs and spices like galangal and lemongrass. The red curry powder omits turmeric and uses red chilies instead. The green version gets its color from the use of lemongrass, lime leaves, and green chili peppers. Vadouvan is the French interpretation of an Indian spice blend called vadagam. It was first made by French chefs in the Pondicherry settlement region of India, which was once a French colony. Its flavors are mild and precisely balanced to appeal to the French palate. As a British colony, the island of Jamaica had its food culture strongly influenced by the British. That influence included the adoption of curry powder, which was then modified over time to suit local tastes. Jamaican curry powder is not spicy as fresh scotch bonnet peppers are typically added to the dish to supply the desired level of heat. Arguably the mildest curry, Japanese curry powder can be somewhat peppery but is usually mild. To make an authentic tasting Japanese curry powder, you may have to assemble the spices yourself as the traditional version is sold in blocks (resembling large bouillon cubes) instead of in powder form. The ingredients are essentially the same as those in standard curry powder and include turmeric, cardamom, and fenugreek.